The Foundation works with concepts which are designed to assist alignment by increasing awareness of self and purpose. Included in these concepts are the areas of consciousness which create three groupings from the twelve houses of the horoscope. These three areas express, on the planes of personality, the three divine aspects. Please note that this is the case only from the angle of the personality. From the angle of the soul, the totality of the twelve houses is the first, or Father aspect. House IV the separated self. House XII the universal self. These three aspects of awareness create the three permanent atoms of the causal body. The position of the Sun in the natal chart indicates the area of consciousness in which a person needs to be developing in the present lifetime under the supervision of the soul (Ascendant and ruler); the Moon and Saturn indicate the kind of consciousness developed in past life. The areas of consciousness are of themselves no guide to the level of development. 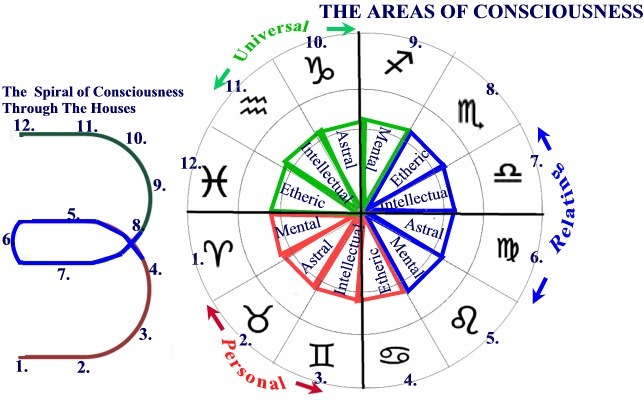 Whilst it is the case that universal consciousness is closer to soul consciousness than that of the other two areas, and whilst it is the case that the consciousness of the separated self becomes soul consciousness by passing into relating and then universal consciousness, anyone involved in astrology must be aware of the cyclical nature of development e.g., Houses IX to XII can be the host to a personality which has yet to individuate, as well as to the individual developing universal consciousness. The areas of consciousness have a value in that they impose a principled superstructure upon the diversity of the twelve houses and emphasize the developmental purpose underlying experience in any of these areas of life.